Love traditional Japanese art? Enjoy this wonderful new Japanese notebook featuring a lovely Geisha by the renowned artist Tornai. 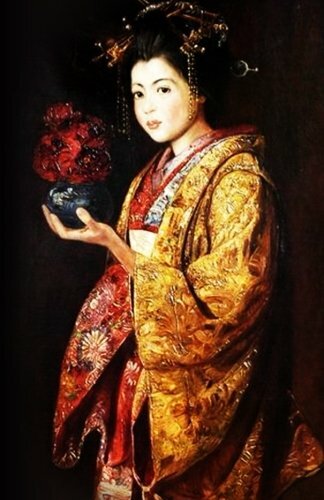 Considered a great "orientalist" painter, Tornai gained great fame in the 1800s. Use the lined journal yourself or give it as a gift. A perfect gift for women and for all Japanese art lovers. Ready to Write Your Way into a New Life? Most of us know there is power in words, but are you aware of the force created from keeping a journal? This handy, portable, lined journal to write in is exactly what you need to enjoy the power of a self-discovery journal. Maybe you're the type of person who loves to journal, write, capture your thoughts, record events, track daily activities, make lists, count blessings, express gratitude, create goals, or engage in a conversation with yourself, you'll find this lined notebook perfect. And don't forget, this Fine Arts journal makes a wonderful gift, too. The Fine Arts Journals series features gorgeous and exquisite paintings by world-renowned artists. As you can see, there are many reasons why this journal can be of help. Why not scroll up and get your copy today? Beautiful Journals and Notebooks offers many more styles and varieties of journals and their usefulness is only limited by your imagination. Catch a dream, create a prayer list, or simply use one to record your expenditures as you go about your daily life. There are a 1001 ways to use a journal. What's your way? Beautiful Journals and Notebooks offers many more styles and varieties of journals and their usefulness is only limited by your imagination. Catch a dream, create a prayer list, or simply use it to record your expenditures as you go about your daily life. There are a 1001 ways to use a journal. What's your way?